A couple of weeks back, Mumbai was the home to the third edition of the country's biggest black metal festival called Black Metal Krieg. The brainchild of Stark Denial vocalist, Kunal Marie Gonsalves, Black Metal Krieg came back this year with the biggest line up yet. 9 bands from across the country convened at Hotel United 21, Thane on 8th December, 2013 which served as the unholy altar that day. The first band on the roster was Spiked Crib from Mumbai, who were playing live after quite a long time. They promptly took stage at 4.00 pm and kicked off with a barrage of original compositions that sounded furious and tight. It must be noted that not many opening bands manage to get a pit started. But here, the first circle pit of the day was initiated by Spiked Crib. They were joined on stage for the last song by guest vocalist Khyati Bhatia, who's clean singing added a very gothic edge to their sound. 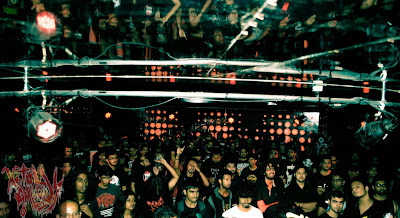 Overall, Spiked Crib delivered a slew of tight sounding black metal tracks and kicked off the event with full force. The next band on stage was Dormant Inferno, the Doom / Death Metal band from Mumbai. This show marked their comeback to the live gigging circuit and they did not fail to seize the opportunity. Their bass heavy music sounded absolutely crushing and it left all of audience in awe. They started off with an intro, which was followed by three songs from their 2011 EP, In-Sanity. The growled vocals, heavy bass and slow to mid tempo riffs had a mesmerizing effect on the audience. 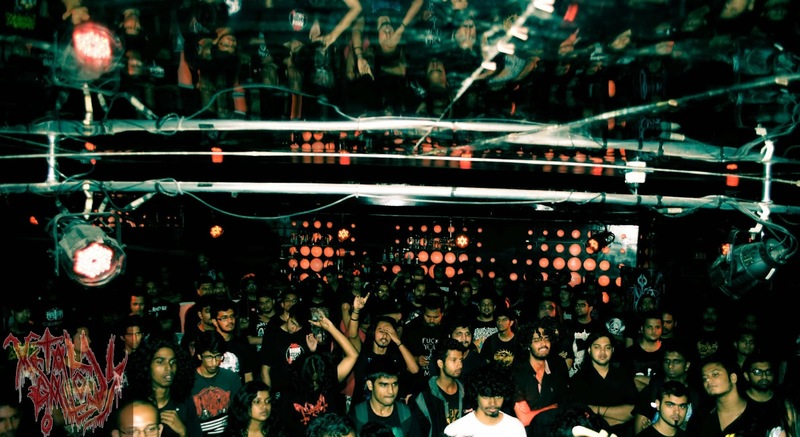 The satanic black metallers of Mumbai, Solar Deity were the next bands to take stage. They emerged as a four piece, with their drum machine being replaced by a full time drummer and vocalist Aditya Mehta freed from his guitar duties. The change in line up definitely had an impact on their sound as they proceeded to conjure up a black metal storm, with songs both from their recent EP Devil Worship and their older EP In The Name Of Satan. The vocalist had a great stage presence as he kept took every opportunity to strike an evil looking pose. These lads had come all the way from Jaipur, Rajasthan and their inclusion in the roster was totally justified when they started playing their brand of progressive death metal, that was laced with deliciously dark melodies. Their long song lengths however, meant they had stage time for only two songs from their Dis-Illumination EP. The organizers granted them time for one more song and the band covered Celtic Frost's "Circle Of Tyrants" at the behest of the audience request. Overall, their set was well executed and well delivered. Dark Desolation came on stage with their guitarist and vocalist sporting corpse paint and looking as demonic as possible. Their brand of black grind suited their demonic look very well. Standing in front of the stage felt like standing in the middle of battleground. The vocalist Maggot took the audience by great surprise as his style of vocal deliver seemed to be pain inflicting. Theirs was a set that was laden with ample helpings of distorted tremolos and hyper fast blast beats. Despite a small technical glitch in their set, the band sounded absolutely ferocious and merciless throughout their set. These lads from Bangalore, were one of the highlights of the night. This band was clearly one of the crowd favourites as the cheering ensued the moment these corpse painted warriors took stage. This was their DVD release show where they unveiled their live DVD, Rise Of The Funeral Smoke. They played all the songs from their self titled debut EP and were joined by the crowd for the chorus of 'Burial Of Thy Own' and the opening symphonic lines of 'Journey'. The joy could be clearly seen on the vocalist's face as the crowd started singing along with him. Their set was complete with a cover of the mighty Emperor. The force from Guwahati followed next. Initially, I was mislead by the size of this three piece band. But the moment they started playing, I was completely blown back the sheer intensity of their sound. This band conjured up all kinds of brutality as they made their way through tracks from their 2012 EP, Apogee Of An Inquisition. Their set included a cover of the Norwegian band Cadaver. They closed their brutal set by treating the audience with a brand new song they had conjured up. This show was also the album launch gig for the organizing band Stark Denial. Their performance that night was absolutely perfect to the tee. They rendered all the original tracks from their newest release War EP, while also including a couple of their older compositions. True to the name of the gig, the band covered 'Black Metal ist Krieg' by the mighty Nargaroth. The atmosphere present in their sound, in combination with the groove in the songs made this one of the most enjoyable sets of the night. Last but not least, it was the turn of 1833 AD, who had come all the way from Delhi. The band had an excellent interaction with the crowd, as they let the audience pick the songs they wanted to hear. They delivered original tracks from their brilliant 2012 debut album My Dark Symphony. Their solos and melodies sounded perfect to what was heard on the record. The band wasted no time as they kept unleashing one song after the other. They proved to be the perfect act to close an event of such an intense line up. You can view photos from the concert HERE!! !